1.Micro-process-controlled electro-static discharge(ESD) safe unit. 2.Easy to use touch type panel controls with digital display. 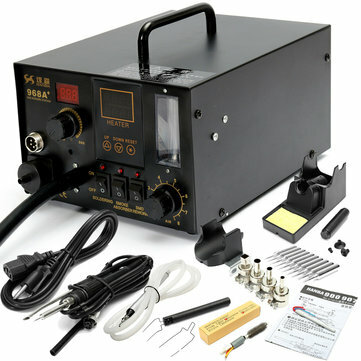 3.Environment-friendly repairing system that integrates hot air gun, soldering iron, and smoke absorber in one package. 4.Built-in smoke extractor that absorbs fumes created at the source. 5.Knob type soldering iron temperature control for simple yet efficient working temperature selection. 6.Intelligent error-reporting mechanism. Detects and informs the personnel fpr problems with the sensor and heating element. 7.Auto-cooling functionality. Blows air to cool down the system to a safe temperature before turning OFF. 8.Compatibility with various types of air nozzles. 9.Compatibility with different kinds of soldering tips.